Looking for gifts for that special man in your life? Look no further! 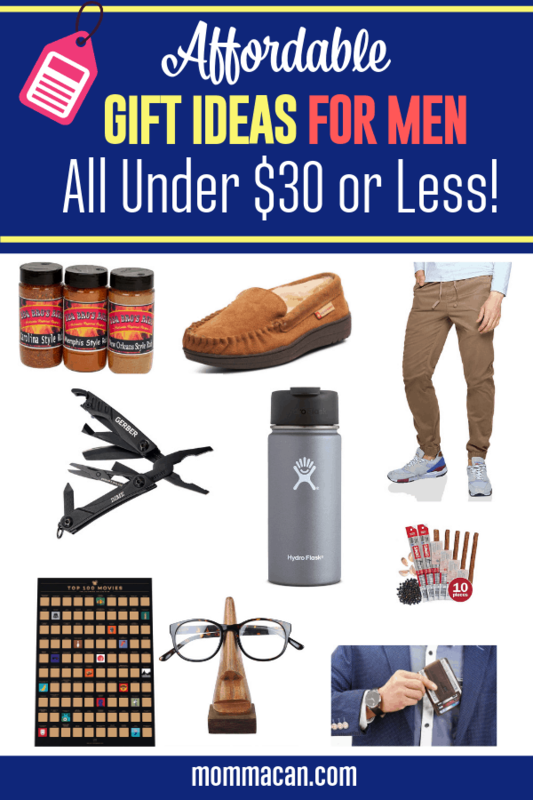 Today I am sharing affordable gift ideas men will love! These gifts are perfect for Christmas, Valentine’s Day, Birthdays, Graduation and more! The best part! They are all under 30 dollars! Do you need budget-friendly gift ideas for the guys in your life? Affordable gift ideas men will love seems like a tall order but we have some wonderful items to browse. Check out the scratch-off movie poster, the multi-tool and comfy but durable jogger chinos! Our gift list has been created of items that are cheap at under 30 bucks! Yep, and the best part this list if full of gift ideas that will actually get used. Gone are the days when you can just keep buying dad coffee mugs, paisley ties, and white handkerchiefs. There are just so many options now with online shopping that the sky is the limit for budget-friendly great gifts for men. There are affiliate links in this post. This adds no cost to you but helps keep my coffee supply regular and keeps this blog thriving. Read my full disclosure here. Handcrafted Wooden Eyeglass Spectacle Holder A fun handcrafted eyeglass holder that will not look too silly on any guy’s desk. It reminds me of a Mr. Potato Head with attitude! I love that you will be easily able to find your glasses while having a quirky conversational piece on your desk. This is a perfect affordable gift from the kids to dad or for a brother or dad! 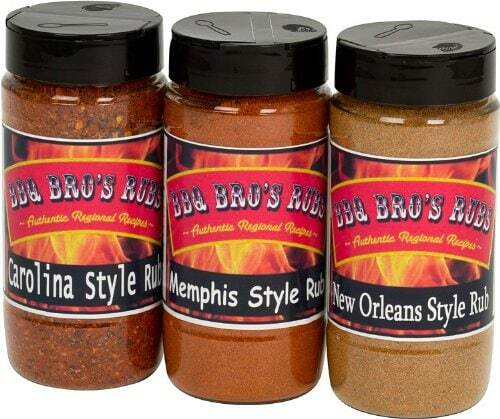 We love adding BBQ rub to baked beans, deviled eggs, and sprinkled on hot fries! 12 oz Hydro Flask Double Wall Vacuum Insulated Stainless Steel Water Bottle which can also be used as a travel coffee mug is the perfect gift for the on the go dad/husband/man in your life. Meets your everyday hydration needs in one container, all while keeping it piping hot or ice cold and fitting comfortable and conveniently in your hand or your vehicles’ cup holders. The 12 oz size fits under most single cup coffee brewing systems! We love that it is designed with a slip-free grip and is insulated to keep the hot stuff hot while not burning your fingers. This is our top pick for the on the go man. There are so many colors to choose from but we are loving this graphite color! 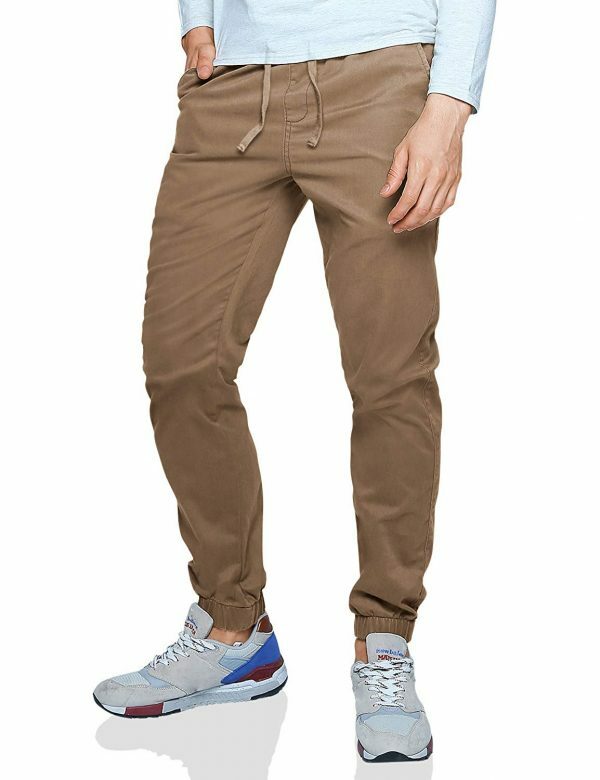 Match Men’s Chino Jogger Pants Stylish slim style Chino joggers are perfect for any kind of weekend event outdoors or for a family night at the movies or enjoying dinner with friends. These come in an assortment of colors and are a great price! This is a gift I know my adult son with a toddler will love. He can look great and still have a full range of movement to chase after his active daughter. 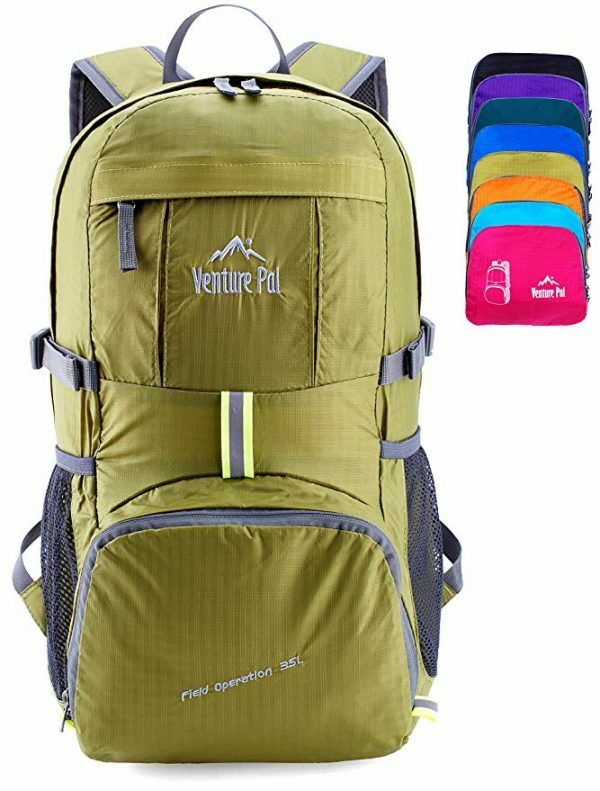 Venture Pal Lightweight Packable Durable Travel Hiking Backpack – A perfect daypack for hiking and visiting amusement parks with the family. This comes in several bright colors, so spotting dad in a crowd will be a snap. I love natural colors but a bright purple or pink for a Disney Trip would be an amazing gift for Disney Lovers. This Venture Pal Backpack is made with high-quality tear and water resistant material provides extra strength and long-lasting performance with the lightest weight possible. This bag has tons of compartments and is a made of mesh material to keep the guy in your life cool. This makes a great gift especially for those hard to buy for men in your life. Men love grass-fed beef jerky, at least I know my sons love it. 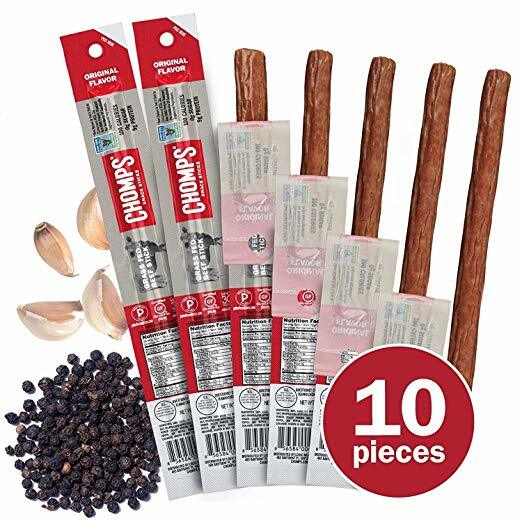 CHOMPS Grass Fed Beef Jerky Snack Sticks are keto and paleo friendly and come individually wrapped. If you like a gift that will not end up dusty in a closet someplace snacks are the way to go! Each 1.15 oz stick packs 9g of protein that is low in sodium, fat, and only 100 calories. This makes for a healthy snack that is natural and also carb free, gluten free, soy free, dairy free, and artificial preservative-free! Yep, 100 Calories! 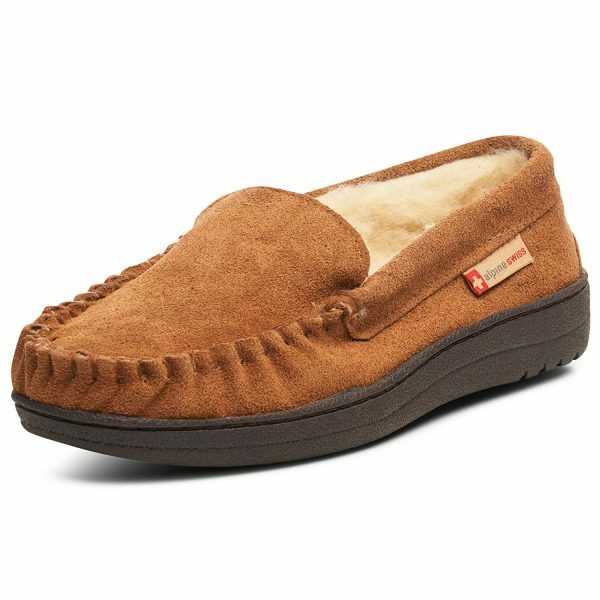 Men’s Genuine Suede Shearling Slip On Moccasin Slippers – Slippers are cozy in the winter and comfy in the summer. They are a universal perfect gift for all men because they something to slip on after work and take a much-needed break from the stress of daily life. This gift is great for grandpas, dad, brothers, uncles, and anyone who can put the cozy slipper on and say great fit! And they will not break the bank so its a win for everyone. 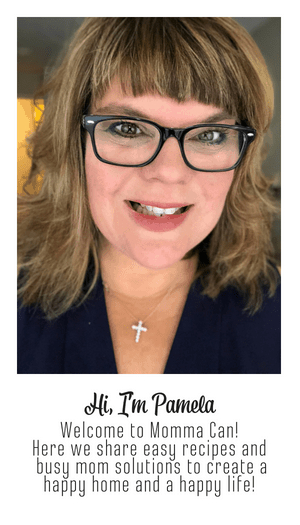 Medium Width – The Perfect Affordable Gift! If the man in your life is a movie lover, then look no further! This is a fun gift to use and discover what movies he as seen and what other movies you can plan for the next movie night! 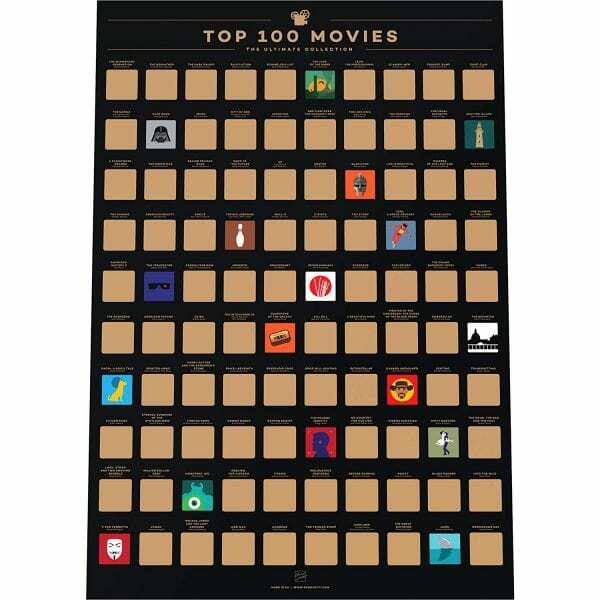 The Enno Vatti 100 Movies Scratch Off Poster is filled with the top 100 movies of all time. You guy will love scratching off the ones he has seen and explaining away the ones he has not. This is a great gift and also comes in a Music Lovers Version ! 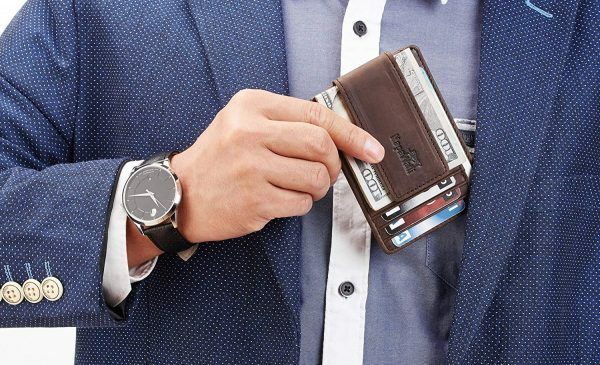 Leather Magnetic Front Pocket Money Clip Wallet RFID Blocking – This front pocket wallet has three card slots, an id holder and two extra slots, it comes with 4 magnetics to keep your cash safe beneath the clip. Bonus, this wallet comes in a dozen fun colors. We love Crazy Horse Coffee! Right? Best name for a wallet color ever! 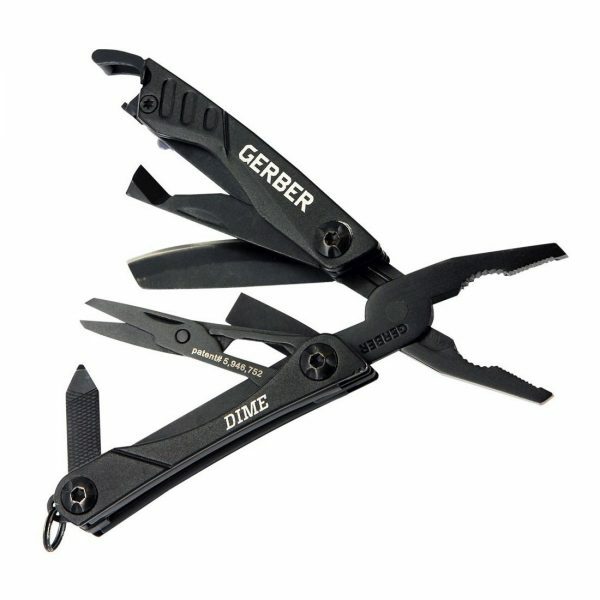 Gerber Dime Multi-Tool – The miracle of 10 tools in one! Fits easily in your pocket! Why carry a plain old keychain when you can carry the Gerber Multi-Tool? This is a great affordable gift that I would love! Pretty sure this would make a great gift for any guy. Mini Drone – Because all the cool kids have one. This mini-drone is amazing! It is compact so there is not fretting over space hogging while you charge it. It is the perfect gift for any age and users say it is a great way to be introduced to drones. Learning to fly an affordably priced drone is the way to go before you do the big splurge and learn how to attach cameras etc. Grab this amazing drone give it as a gift to your favorite men. This includes grandpa, dad, uncle, or son! Six pack of their favorite beverage or surprise them with a six pack of fancy pants root beer or local beer. Use this great container to present your gift. Movie Tickets are thoughtful and useful. Place the tickets tucked in a bag of gourmet popping corn or a snazzy bag of candy. Done! We love this mini collection of popcorn for gifting. Daily Knit Beanie – Keep your fashionable and warm with the everyday beanie. Warm stretchy and soft this beanie made by Tough is perfect for year round. This is a perfect extra to tuck into the daypack listed above! I hope you were able to find a cool gift for the man in your life. If you have any ideas to add to our gift list for men please share in the comments! If you love this post you might love our gift ideas for moms! Find it here.